The new Michigan Teacher of the Year will be announced soon. It will the 10th MTOY award Meemic has sponsored, and we couldn’t be prouder. In celebration, we reached out to several past recipients, and a few took time from their busy end-of-year activities to let us know how the award affected them and what they’ve been up to since. Paul Galbenski served for the 2011-12 school year. My time as MTOY was the best year of professional learning that I have ever experienced. Being able to visit classrooms across our great state of Michigan allowed me to learn from outstanding educators and students! Being able to share best practices at the local, regional and state level has been and continues to be a great experience. Being Michigan’s Teacher of the Year also allowed for the spotlight to shine on all the excellent teaching and learning that is going on in classrooms throughout Michigan! I am very grateful that Michigan allows the current Teacher of the Year to have a seat and a voice at the State Board of Education. Having a seat at the State Board of Education was not only a great learning experience, but provided an opportunity for our state superintendent and board to hear all of the successes that students are experiencing in classrooms and especially all of the wonderful opportunities available to students through career and technical education. I am also very grateful for Meemic and their support of the Michigan Teacher of the Year program as we continue to honor teachers for their outstanding work and dedication to truly making a difference in our students’ lives. Just as I was ready to move forward into my classroom after completing my year as Michigan’s Teacher of the Year, I was provided an opportunity to move into administration. Where does the time go? 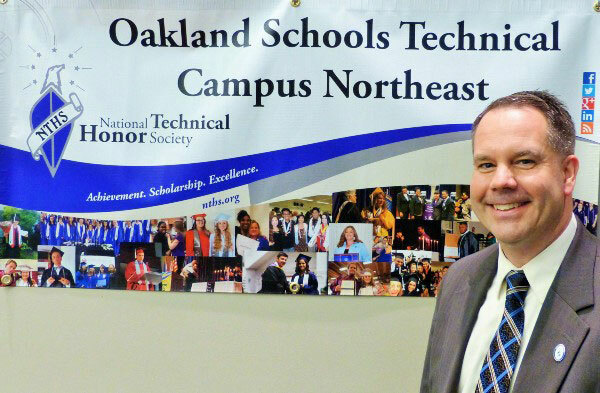 That was four years ago, as I am just now completing my fourth year as the dean of the Oakland Schools Technical Campus Northeast. Having spent 21 years in the classroom as a career and technical education teacher, I made the move from the classroom to running a career and technical education campus. The first few years were a whirlwind, but making this move has allowed me to continue to be an ambassador for career and technical education, as well as be a leader throughout Oakland county and the State of Michigan regarding career and technical education. As we work with students and parents regarding their options within career and technical education, we all know that when you take rigorous academics and marry them with high-end technical skills, these students certainly have a competitive advantage as they move from high school to their chosen post-secondary learning opportunities!